Good to remember: 1. Use fresh hog plums for better results. 2. powder the masala a little less than fine is also for taste. 3. 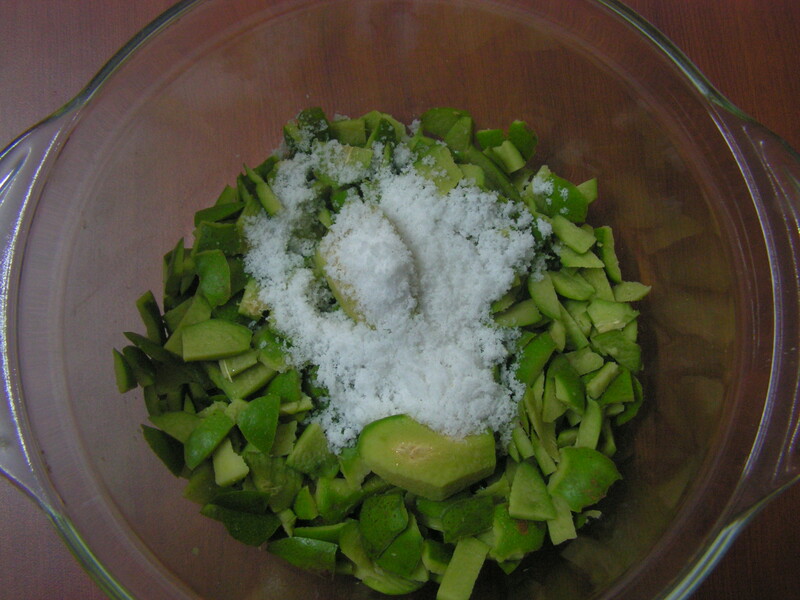 Do not add more salt and can always add at the end on checking for salt. This entry was posted in Uncategorized and tagged Hog plum recipes, Pickles. 1. Wash and chop all the veggies into small pieces and pat dry the same on a dry towel for about 3-4 hours till it is completely free of moisture. 2. Place a broad based bowl with 3 cups of water in it. Add salt and bring it to boil and let it boil for another 5 minutes on low flame. Allow it to cool completely. Add chopped veggies to it and let it stand for about 2-3 hours in it. 3. Place a spatula with 1 teaspoon cooking oil in it and fry asafoetida in it till crispy. Later on fry mustard seeds and add fenugreek seeds and switch off the flame and keep it aside. Allow it to cool. 4. 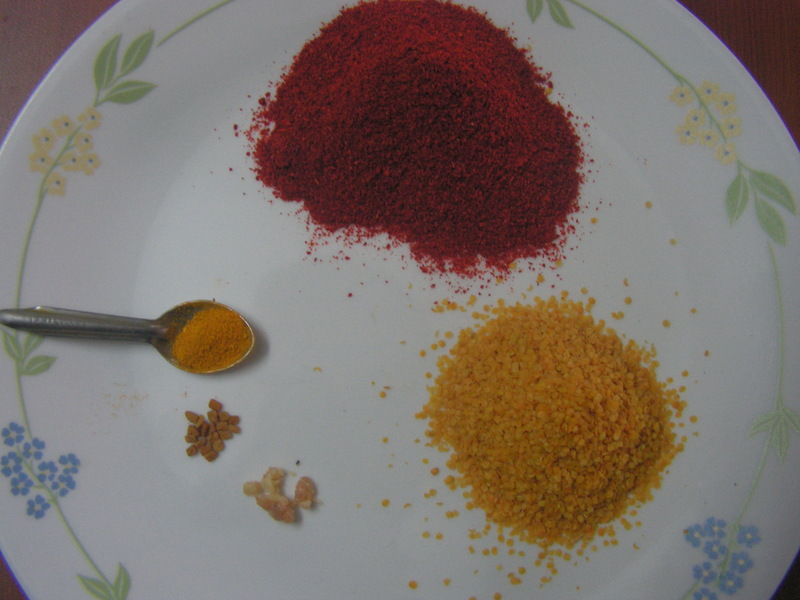 Grind chili powder, mustard dal, fenugreek seeds, asfoetida, turmeric powder and also fried cooled ingredients adding salt water from the veggies to a fine consistency. Allow it to cool. On cooling add it to the veggies from step 2 to it and refrigerate it. Yummmmmm!!!!! Enjoy with rice and dal or even with idli, dosa etc..,The gravy in the pictorial at the bottom may appear to be thin but will be fine in a couple of days!!!!!!!!!!!!!! ( Do not add all water and may wait for about 2 hours to settle for the consistency of pickle , since veggies absorb it and one would exactly know how much of salt water has to be added to it. If not adding more of salt water(i mean the salt water in which chopped veggies is immersed) check for salt and only add a little if needed , stir and then bottle it. USE ONLY DRY SPOONS FOR SERVING & PRESERVE IT IN THE REFRIGERATOR!!!!!!!!!! 1. All the veggies should be fresh and tender for best results. 2. The reason to add a little of the fried masala is for extra flavor. 3. It should be refrigerated all the time. Never use a wet spoon for serving ! 4. Please do not keep it outside at all to avoid it from getting perished!!!!!! 5. 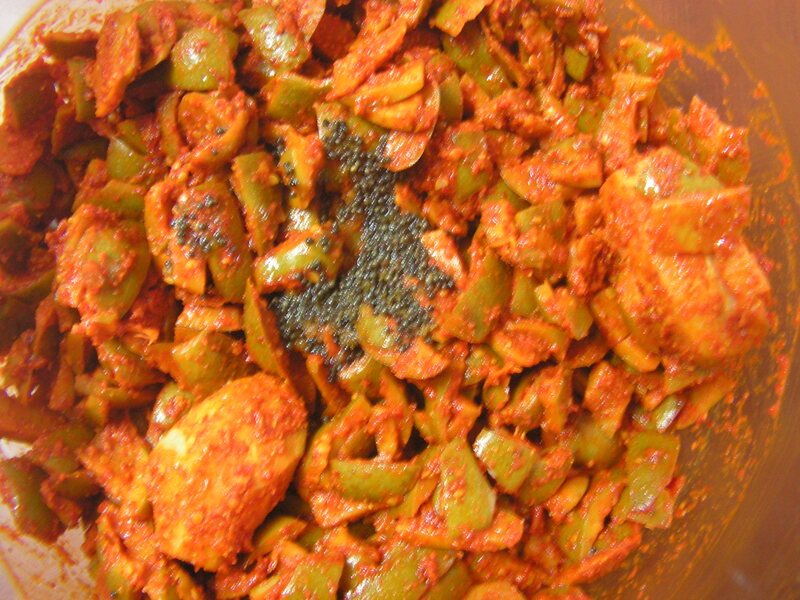 On adding the grind masala one may not add the whole salt solution to the pickle and may wait for a while for the pickle to settle down and then do the needful as instructed above in the text. This entry was posted in Uncategorized and tagged Pickles. I have already put up a few pickles recipes on this blog namely Lemon pickle, Instant Mango pickle, Star fruit pickle and Raw Jack pickle. Today I am putting up a mixed pickle which I tried a couple of times before having a few friends/family sample. And now it goes up here if some of you wanted to try. thought of just sharing with all the viewers. 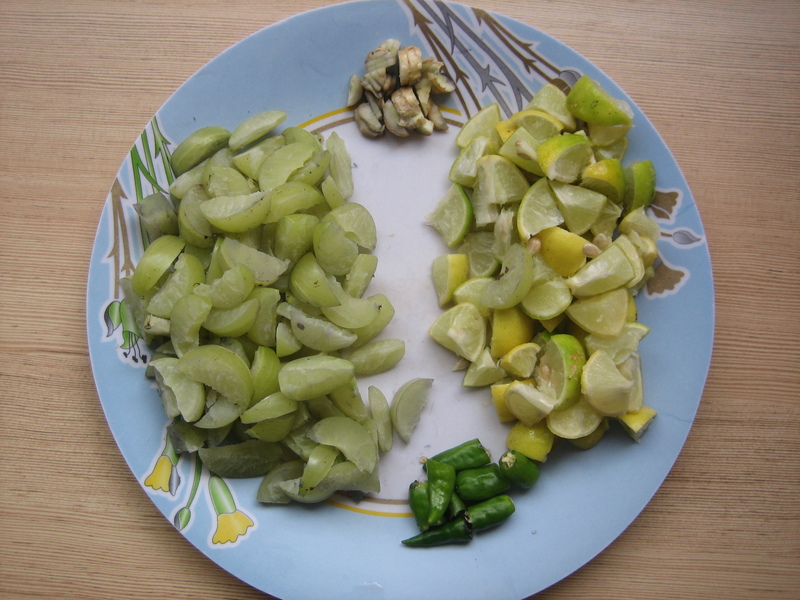 It is a mixed pickle of Lemon, Amla , Mango Ginger and the green chilly. Here is my version of this pickle. 1. Dry roast salt in a skillet on a low/medium flame till it turns dry and free falling consistency. 2. Wash and dry mango ginger on a piece of cloth to dry it. 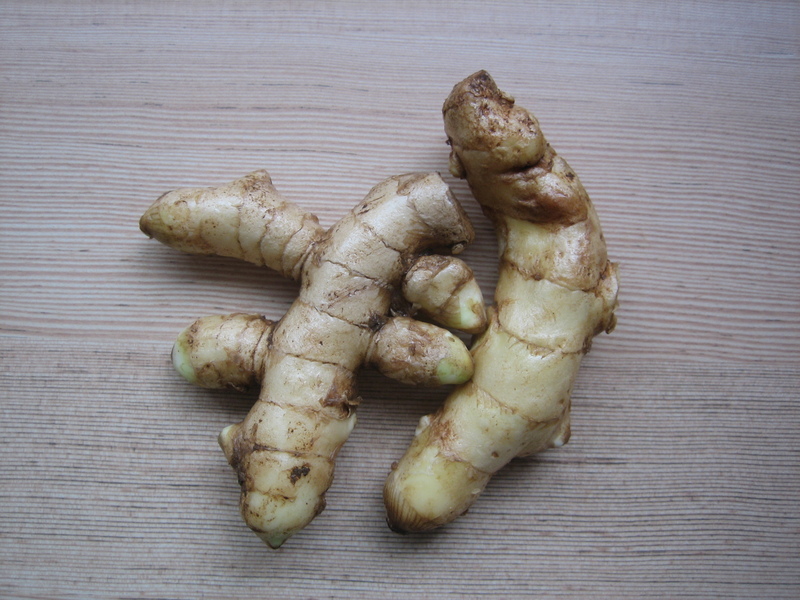 Cut it into small pieces, also wash and chop lemon and pit Amla and chop it too. Cut Green chilly into pieces. 3. Place a spatula with 2-3 teaspoons of cooking oil in it on low flame and fry soft Asafoetida in it till crispy. Allow it to cool. 4. In the same spatula fry fenugreek seeds till done and keep it aside. 5. Just heat oil in a spatula and warm up Mustard dal in it and immediately transfer it to a plate to cool. 6. Heat oil in a spatula, switch off and just add chilli powder to warm it up but do not burn it. 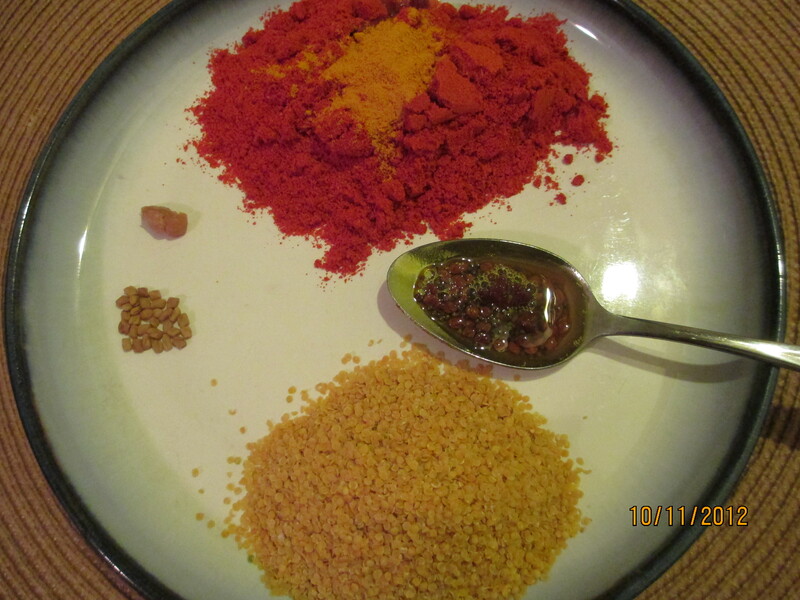 Add turmeric powder too and warm it up to mix with chilli powder on switching of the flame. 7. 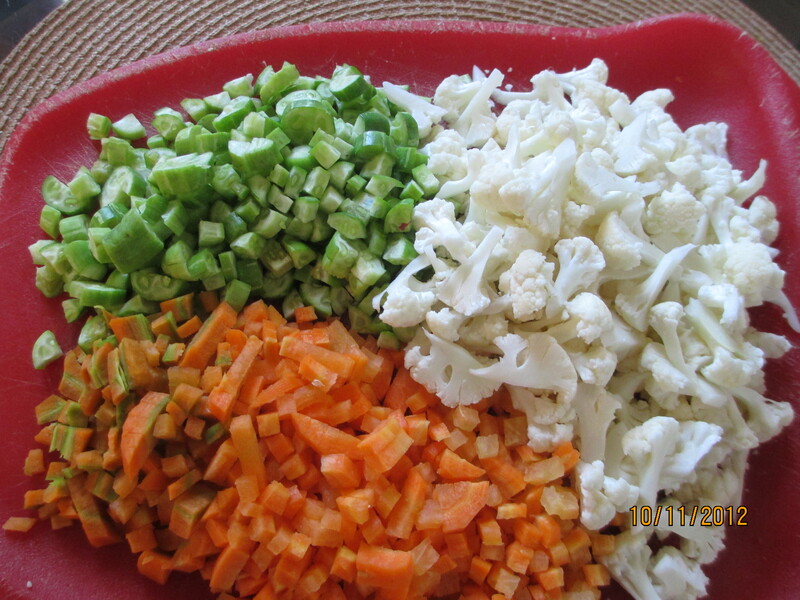 Apply salt and sugar to the chopped veggies from step-2 to it. 1. Use dry spoons for any pickle to enhance the shelf life of the same. 2. Use ripe lemons and fresh Amla. 3. Roasting Salt is to get rid of the sogginess and turn it free flow. Adding sugar is optional but taste wise I would recommend it. 4. Always warm up oil and add all ingredients one after the other in steps so that it is not burnt. 1. Peel, and remove the ‘eyes’ of pineapple properly so that the fruit is clear. Chop it into bite size pieces as shown in Image-1. 2. Place a skillet with chopped pineapple pieces in it and add required quantity of sugar to it. Heat and stir continuously till done. 3. Cook till sugar syrup attains a consistency in such a way, that when it is poured on a plate, it does not flow and stays intact (imagine tar consistency). Add a few strings of saffron to it and switch off the flame. 4. On cooling, transfer and store it in a bottle. It will remain palatable for months if dry spoons is used while in use. This entry was posted in Uncategorized and tagged 45 minutes, Pickles, Side dish for Rotis, Summer food. Summer is coming to an end, so also the the pickle season. 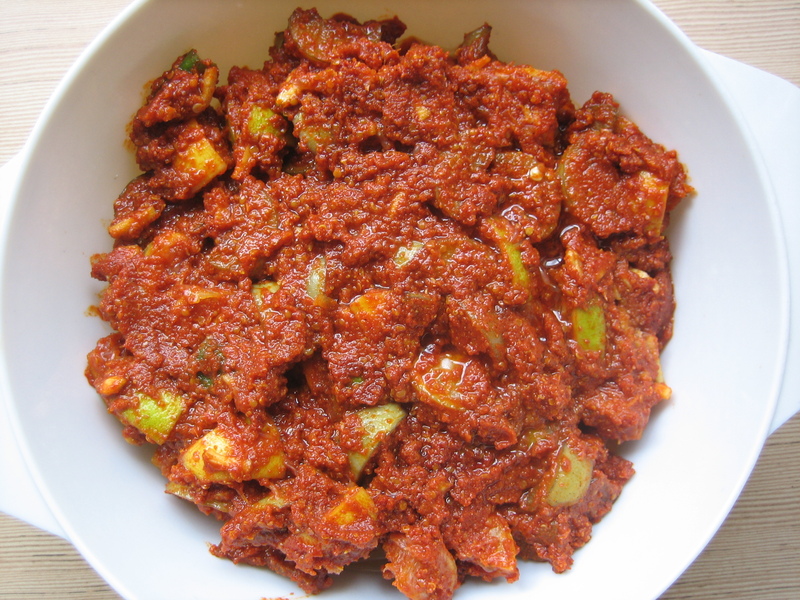 I would like to put up this recipe for instant mango pickle which can be prepared in a span of 30 minutes and has a shelf life of more than 3 months if stored in the refrigerator. I have already put up a few pickles like the lemon pickle,, Star fruit pickle, chopped raw mango pickle (ambe hindi), bilimbi pickle and the raw jack pickle (adgai). This is an easy recipe for starters as well. 1. Wash and wipe the raw mangoes and on drying chop it into bite size pieces and keep it aside as shown in image-2. 2. Place a spatula with 1 Teaspoon of cooking oil in on medium/low flame and fry asafoetida(soft) in it till crispy and light brown and keep it aside. 3. 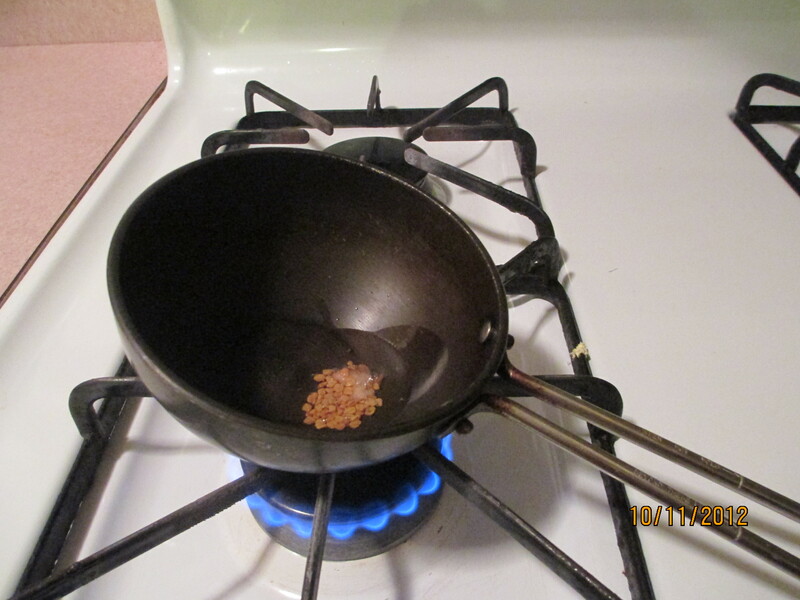 In the same spatula again, on heating the oil, fry fenugreek seeds in it till done and keep it with fried asafoetida. 4. Add a little more oil, and on heating fry mustard dal in it and mix it with the other two ingredients earlier draining extra oil from it. 5. Heat oil, switch off the flame and add chilli powder to it just stir with the spatula. 7. Mix the masala powder and the required quantity of salt to the cut raw mangoes and mix with a wooden spatula. Add 2 Teaspoons of raw oil to it and keep it aside for 3-4 hours and later preserve it in the regrigerator..
1. Always use fresh raw mangoes to avoid it from turning soft. 2. One can even use mustard seeds in place of mustard dal. While using mustard just dry roast and remove the skin so that the colour of pickle is maintained and also it helps in keeping the mango pieces fresh and crisp. 3. One can use cooking oil of your choice. I always use” Saffola gold heart” oil since it is odourless. 4. Keep the pickle at room temperature for about 4-5 hours and later, preserve it in the refrigerator. 5. Check for salt and spicyness before pushing it in the refrigerator. The reason being that the quantity of masala and salt depends upon the tangyness of mango. 6. Do not use water at all. 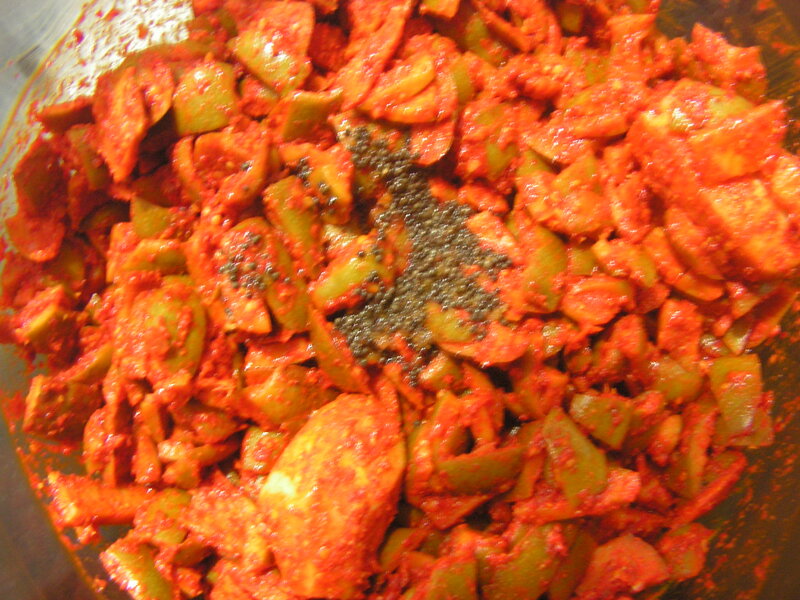 Once you add salt and masala it gets mixed and the pickle would look as shown in the image -10. 7. Only half the quantity of the masala ingredients should be fried in oil and the other should be added raw for better taste and aroma!!!!! This entry was posted in Uncategorized and tagged 30 minutes, Pickles, Summer food. 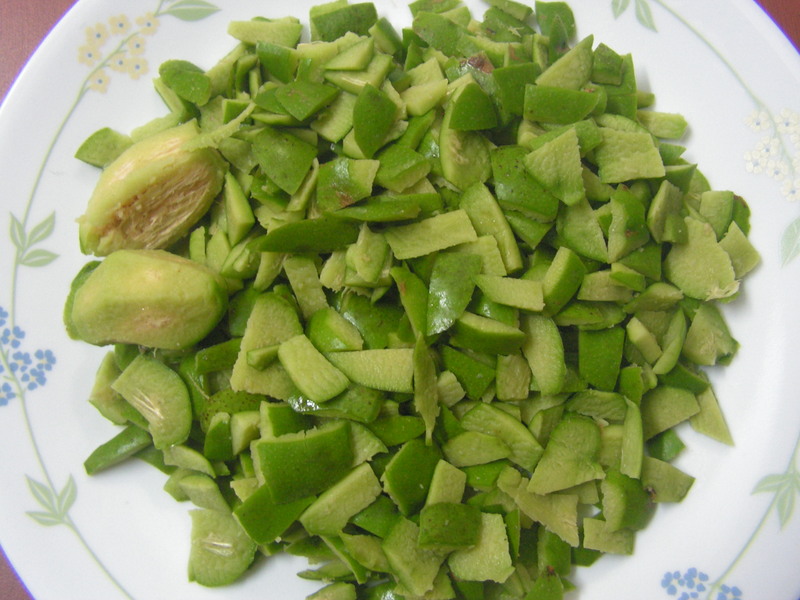 Bilimbi is a tangy fruit/vegetable used in side dishes as well as chutney instead of tomato or tamarind. The advantage of using Bilimbi is that it is fresh from the garden and also gives an elegant colour to the dishes especially the chutney. The taste is will be heavenly compared to the use of tamarind ! 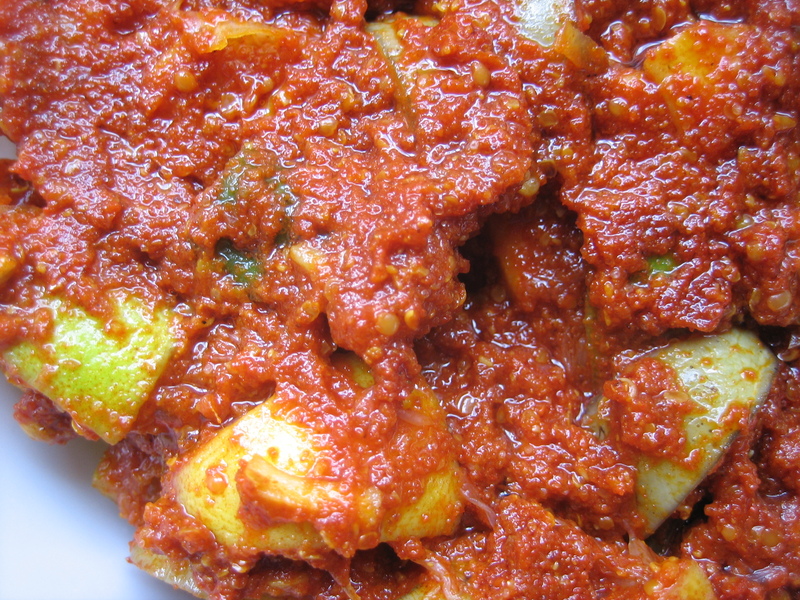 We make fresh pickle using Bilimbi which has a shelf life of around a year, if especially a dry spoon is used. The pickle is so simple and one needs only tender Bilimbi. If little more than tender ones are used, the veggie turns smooth and makes the pickle a disaster. This is a request recipe. 1. Pluck tender Bilimbi and wipe it with a clean cloth and keep it aside in a bowl. 2. Place a spatula with 2 Teaspoons of cooking oil in on medium flame and fry soft Asafoetida in it till crispy and brown. 3. 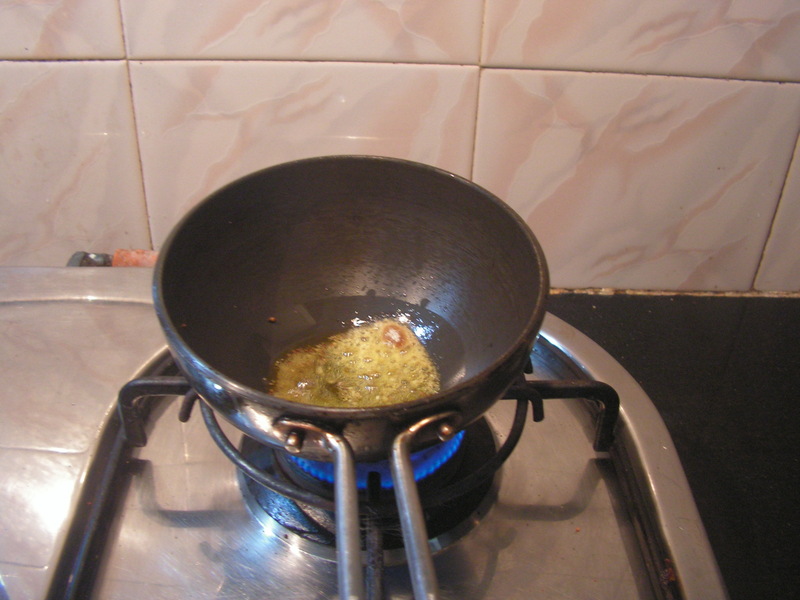 In the same oil, fry fenugreek seeds when oil is hot and switch off the flame. 4. Heat oil again and fry mustard dal in it. Switch off the flame and fry chilli powder and add turmeric powder to it. 5. 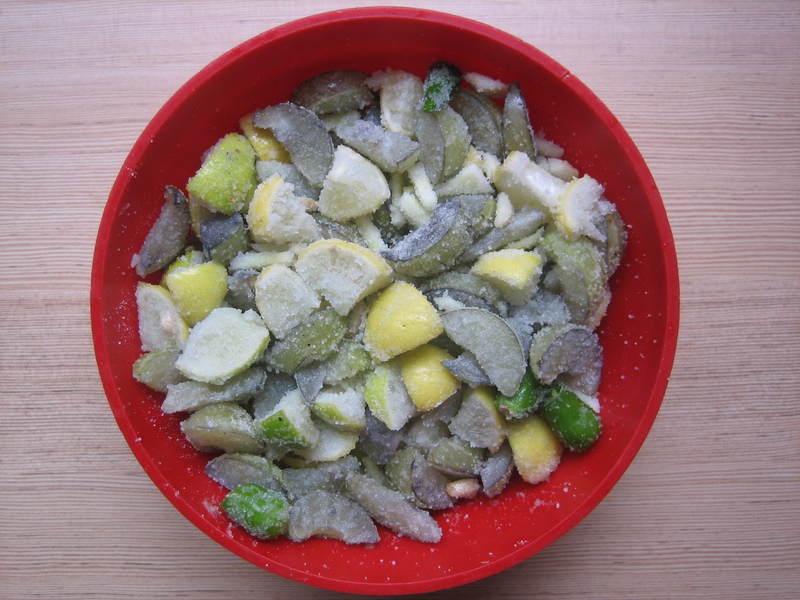 Fried mix would be as shown in the image below. 6. 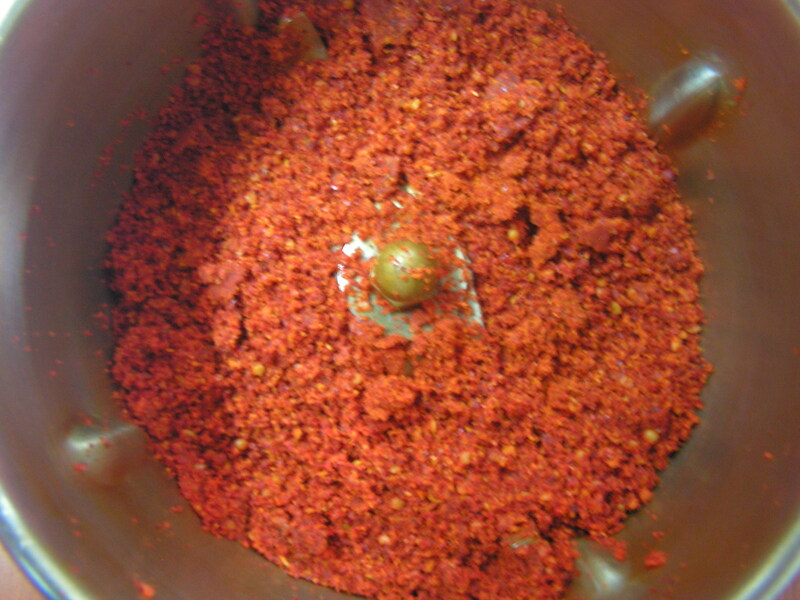 On cooling, powder it in the mixer fine and mix it to the bilimbi from step-1 and also add salt to it. Add 3-4 teaspoons of raw cooking oil to it. 7. Pickle will finally be ready to serve on the next morning. Later store it in the refrigerator. I have also added a few tender Tinduras to it. Heat 2 Teaspoons of cooking oil on the flame. Add Asafoetida to it. Cool the oil and mix it to the pickl;e on bottling the same. This has a long shelf life of one year. 1. 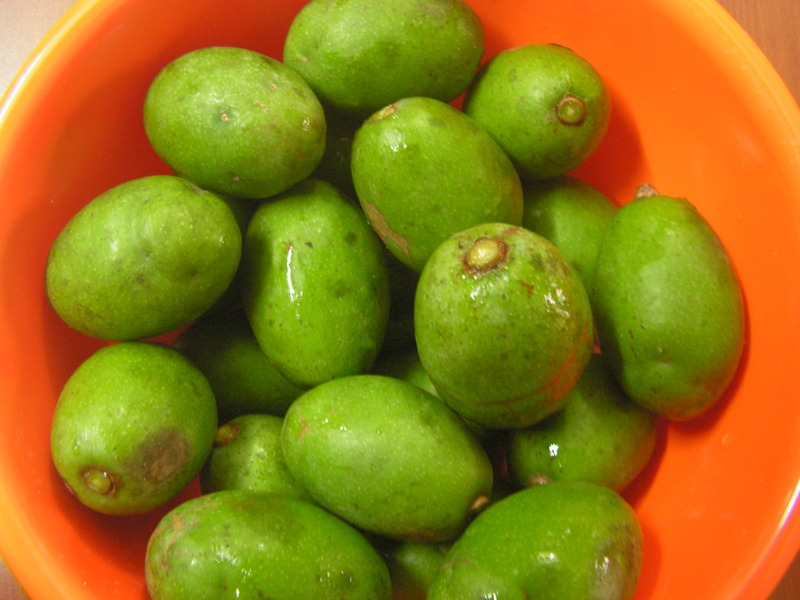 Use only fresh and tender Bilimbi and and few tender Tinduras for the pickle. If more than tender Bilimbi is used, there is every chance that the pickle could also develop fungus and spoil in no time. 2. 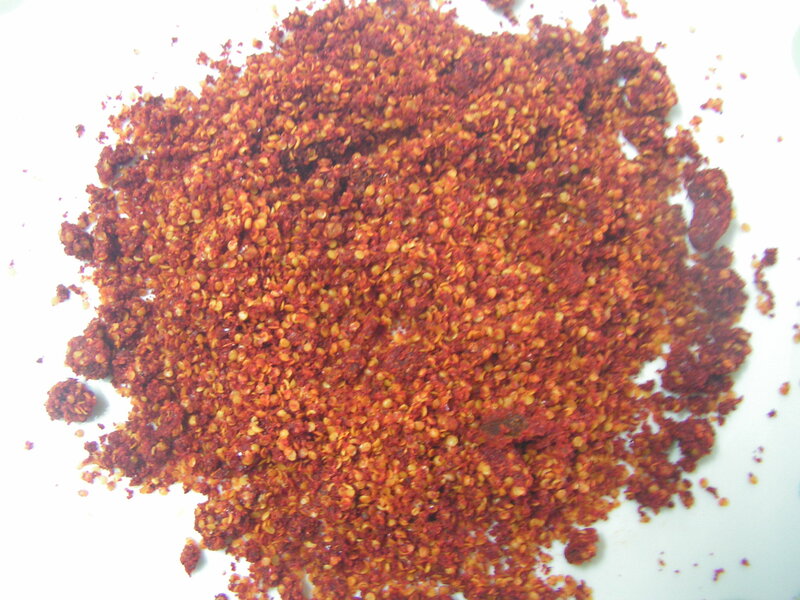 The chilli powder is Byadgi in this recipe; if using different variety then the measurement could vary. 3. Use dry spoons to increase the shelf life of the pickle. 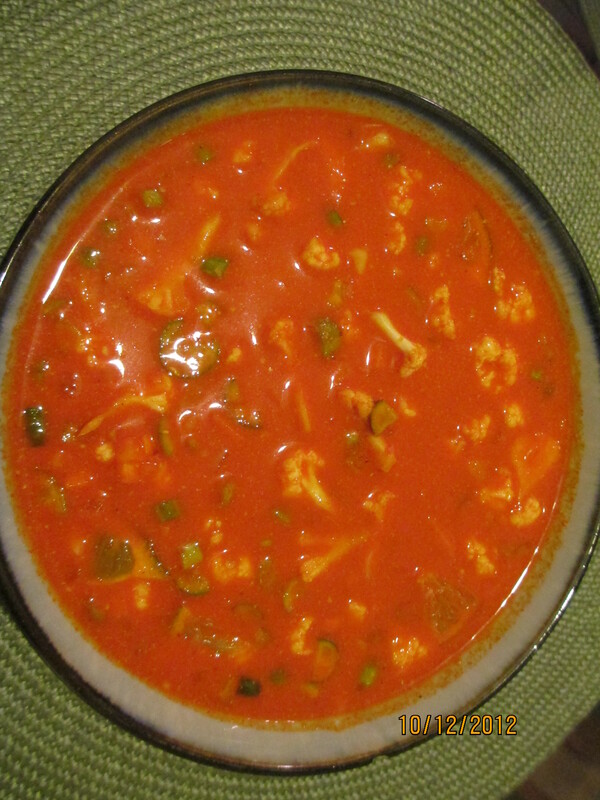 This entry was posted in Uncategorized and tagged Konkani dishes, Konkani food, One hour, Pickles.